Helen, a senior who works at a Senior Center in Philadelphia, tells her story on how health care reform has helped her and other seniors. She explains how the free preventive services provided to seniors under the Patient Protection & Affordable Care Act, the health reform law that some call “Obamacare,” are helping her and all seniors stay well. 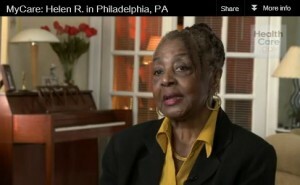 This video, posted on the MyCare section of HealthCare.gov, is part of a series of true stories told by Americans from all backgrounds and demographics, explaining how the health reform law has helped them. HealthCare.gov is a website of the U.S. Department of Health & Human Services (HHS). HHS invites you to add your story to those at MyCare, telling how the health reform law has helped you. This announcement is posted as a public service by HelpingYouCare™.